Buffalo is not the only idiot city when it comes to historic preservation. Lastnight I was sitting around thinking about Leonard Pennario. And Pennario had made a few historic recordings with the Pittsburgh Symphony in a place called the Syria Mosque. I looked up the Syria Mosque. 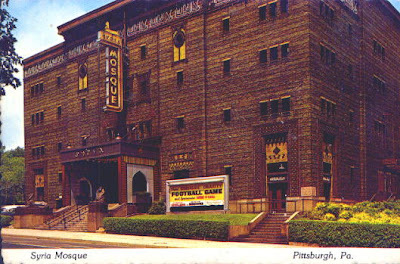 The Pittsburgh Symphony used to perform in the Syria Mosque. What happens in the place now? Nothing! It is a parking lot! The Syria Mosque became a parking lot in 1992. Clearly, Pittsburgh wants to be more like Buffalo. It is too bad. What a classic hulking old place. It went up in 1915, originally built for the Shriners. Look at the lettering on the sign. 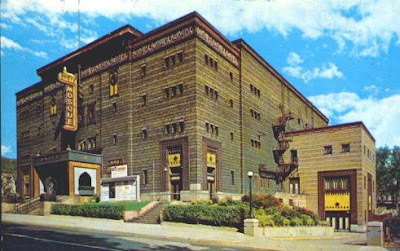 When the Syria Mosque was slated for destruction in August of 1991, Pittsburghers found themselves in an emotional discussion about the importance of music venues in the city. With its ornate architectural exterior and distinctive sphinxes standing guard out front, the Mosque is remembered for its crystal-clear acoustics, 180 degree seating and balcony that almost reached to the stage. The Syria Mosque hosted everything from opera and orchestral music, most memorably concerts and historic recordings by the great pianist Leonard Pennario, to rock acts including Bob Dylan, Chuck Berry, Pink Floyd and Bruce Springsteen. Here is a link to a short radio documentary about the Syria Mosque. I like two things about this radio clip. One is that when they talk about the place being demolished, they play "The Night They Drove Old Dixie Down." The other is that the guy being interviewed talked about how after that they formed Preservation Pittsburgh, and they formed it in a jail cell. I know, I have a thing for old buildings. I do not like to see them become parking lots. Neither does my brother George. I am sure that George is aware of the Syria Mosque. George has been paying visits to Buffalo's Memorial Auditorium as it awaits the end. He said, "I visit the Aud as if it were a terminally ill friend." At least Pennario never played in the Aud. I should go down to the parking lot where the Syria Mosque used to be and put up a plaque. "On this site, Leonard Pennario recorded Gershwin's Concerto in F, with the Pittsburgh Symphony and William Steinberg, on Feb. 8, 1953." It's true! I know it thanks to my new friend Mark Heimbeck-Nielsen, an expert on Capitol Records. And on Feb. 22 Pennario went back to the Syria Mosque and played Liszt's "Mephisto Waltz" and Chopin's "Barcarolle." That is a lot of information to put on a plaque, but I will manage. P.S. Do check out the Pennario link -- here it is again if you don't want to scroll up. It is a great look at the art of recording, a 1957 New York Times story I found just by Googling Pennario and the Syria Mosque. What I like about the story is how it mentions Pennario by last name only. He is like Horowitz. He is legend! Mary, the sad thing is that we've had to fight so hard for the Central Terminal for the last 11 years. And the fight is STILL not over. I'd still say that it's endangered, because our event revenue and grant funding is just enough for general maintenance of the status quo and some modest capital improvements. Large sections of the complex are still in need of sealing and is are in desperate need of repointing, before the bricks fall right off. Where is the outcry? I'm tired of yelling. The Livery gets activists out like a cause celebre, but yet, on the eastside, no one cares. Sorry to be so much of a downer, but Buffalo needs a reality check! What Big Blue has taught me about pointing old brick is that 99.99% of the expense is labor. Mortar is best manufactured in-house by collecting sand from Lake Erie for free and combining it with $8.00 fifty pound sacks of hydrated lime. Appx 3 parts sand to 1 part lime. So for $8.00 you wind up with around 200 pounds of mortar, which is huge. For newer brick construction you can add some portland cement which is also cheap as dirt. 1929 construction may have contained some portland in the mortar and it is easy to tell just by looking at it and evaluating the hardness. Its actually a great way to spend some nice warm afternoons. You can do the job up to one month before you expect freezing temperatures. Hi Howard, our biggest issue is on the tower and that is 271' tall! We need millions of dollars and extensive surrounding scaffolding, like City Hall had a couple years ago. We've already addressed those areas we can reach, but the tower is too big a challenge for us. I saw them using a small unit over at Delaware Towers recently. They use glorified electric drills to power the thing up and down. The height is limited only by the length of rope. Maybe get a few roofers to ride that thing. They have no fear. Thanks for the ideas, Howard. I wouldn't wany any of my volunteers to take such a risk. Keep in mind too, that the tower is in a natural wind tunnel. It makes even replacing the plexiglas that blows out very dangerous. It has to be done from the inside, with 4 guys holding on to each other so they don't get sucked out of the building. Scares me just thinking about it! If you're going to do a plaque, might as well be complete. The Pittsburgh Symphony Orchestra, conducted by William Steinberg. All parts issued on Cap. L-8161, P-8162. All parts issued on Cap. L-8160, P-8162, Pickwick S-4001. All parts issued on Cap. P-8159, Pickwick S-4009. All titles issued on Cap. P-8185, Pickwick S-4010. Excerpt from second title "Siegfried's funeral music"
The Pittsburgh Symphony Orchestra, conducted by William Steinberg with Harry Franklin (on piano). Note: Above titles were recorded at the Pittsburgh International Contemporary Music Festival. The Pittsburgh Symphony Orchestra, conducted by William Steinberg with The Mendelssohn Choir, directed by Russell B. Wichmann, featuring Robert B. Anderson (baritone) and Nell Rankin (vocals). Leonard Pennario (on piano) with The Pittsburgh Symphony Orchestra, conducted by William Steinberg. Both titles issued on Cap. P-8242. All titles issued on Cap. P-8222; Pickwick S-4011?. 2451/52 in order to avoid duplication with previous Pittsburgh sessions. Nathan Milstein (on violin) with The Pittsburgh Symphony Orchestra, conducted by William Steinberg. Both titles issued on Cap. P-8243. TCHAIKOVSKY - Waltz from "Serenade for strings"
Both titles issued on Cap. P-8291, Pickwick S-4028. Note: Date as shown in Pittsburgh Orchestra files. It was listed as January 19 in Milstein artist files. BEETHOVEN - Symphony N° 3 in E flat major, Opus 55 "Eroica"
All titles issued on Cap. P/SP-8368; Seraphim S-60166. BRUCKNER - Symphony N° 4 in E flat "Romantic"
Rudolf Firkusny (on piano) and The Pittsburgh Symphony Orchestra, conducted by William Steinberg. PROKOFIEV - Suite from "Love for Three Oranges"
RIMSKY-KORSAKOV - Suite from "Le Coq d'Or"
BEETHOVEN - Piano Concerto N° 5 in E flat, Opus 73 "Emperor"
Both titles issued on Cap. P/SP-8450, P/SP-8652. Both titles issued on Cap. P/SP-8450. First title is mentioned in artist file as also released on Seraphim S-60293,but this is not confirmed on album label copy. HAYDN - Symphony N° 94 "Surprise"
Both titles issued on Cap. P/SP-8495. All titles issued on Cap. P/SP-8475.